As much as I consider myself a city girl, I really do love calm, serene nature views. Potter and I couldn’t be more excited to be moving to the northern part of LA where there is a lot more greenery, toward the end of this year! The moment we began exploring the area, we immediately fell in love… we love everything that LA has to offer, but the hustle & bustle after working hours can become a little too much. With us being in the northern part of LA, we’ll be close enough, but it’ll finally feel like home! 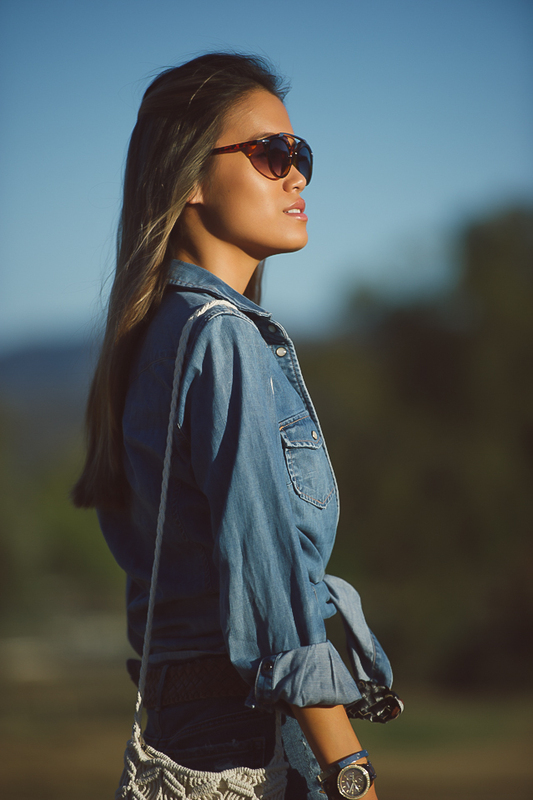 Lately, I’ve been really coveting the chambray meets denim trend (or denim on denim… because you can never get too much denim)! I found it particularly fitting that we happened to be apartment hunting and stopped by this scenic countryside area where I (and my outfit) blended in perfectly. I have also been OBSESSED with this boho fringe tassel crochet bag from BAGGYLOVE.com, an online shop specialising in tote bags, crochet bags, & fabric backpacks. This crochet bag is carefully crafted to give off a unique “hand-made with love” vibe, all the while being very durable and practical. I especially love BAGGYLOVE’s approach to fashion because all of their items are eco-friendly and versatile enough to wear on multiple occasions! To top it off, they are committed to being social-minded. For each bag sold, BAGGYLOVE donates a bag on behalf of the customer to kids in Columbia who can’t afford the luxury of new school bags. Join me in making a difference in a young student’s life by shopping here for your bag needs! I am a fan of small casual backpacks, so I also got a small fabric backpack which I’ve been wearing out to castings, the gym, and on hikes! Follow me on Instagram @stylelullaby!